There are two things that many juniors love doing: role playing as a doctor and playing with their pets. I bet many would also love to role play as veterinarians, even if it’s only with their stuffed animals. Today, Toca Boca released a brand new app called Toca Pet Doctor that allows juniors to role play as veterinarians with real animals. You can consider it as a sequel to Toca Doctor, their great role playing app. 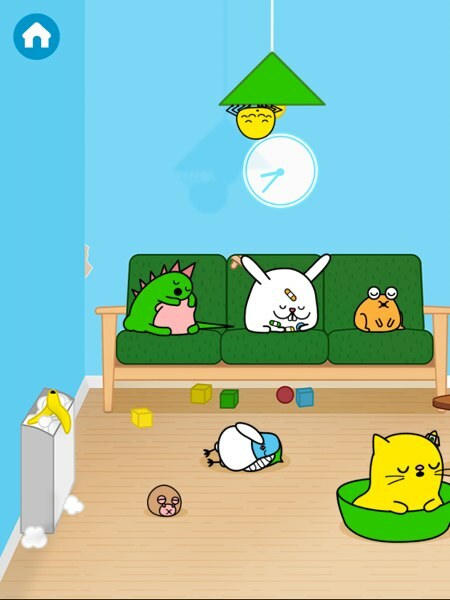 Toca Pet Doctor starts by showing you 15 little pets in the Waiting Room. Each pet has a different injury, and thus a different need. As a veterinarian, your job is to nurse them back to health and feed them with their favourite food. Tap a pet to start the treatment, and the app will show the part where the pet is ill or injured. For example, Bun the budgie has her left feet stuck in gum. Instead of showing her full body, the app zooms in on her left feet to focus on the problem. Once you’ve done your work, you can feed the pet with their favourite food. For example, you can feed Bun with several slices of fruits. The pet will yawn and fall asleep as soon as they finish their meal. You can then restart the process with another pet in the Waiting Room. When you have treated all 15 pets, you can wake them up and replay the game. Toca Pet Doctor has no instructions for treating each pet. Hence, juniors ages 2–3 may need some help figuring out what to do with different cases. For example, in the budgie’s case above, you may need to pull the gum out instead of pulling the budgie up. Other cases may require you to smear back and forth to put a bandaid on, or to drag a turtle’s foot to flip her upside down. Playing together with your juniors also allows them to learn about preferred food for different animals. For example, turtles love to eat sunflowers, whereas worms love to eat dry leaves. Juniors can also learn how to treat common pet problems, such as dog lice or cat wounds. As a bonus, they may also learn about uncommon pets such as snails and iguanas. I love the amount of details put into the app. For example, the clock in the waiting room will show the current time on your iPad. Another example is how different animals make different sounds, especially during the feeding phase. Even the flies (which will be swallowed by the animals) make buzzing sounds. I also like how the pets have their own sleeping styles. For example, the pigeon brings her own pillow, whereas the guinea pig uses a sleeping cap to bed. Different pets also have different eating speed. For example, both rabbits and iguanas love to eat carrots, but the iguana eats faster than the rabbit. Finally, juniors can learn about injuries and illnesses that can also affect human beings. For example, bruises, eye infections, and bumps. Treating the pets will hopefully give juniors a glimpse at what they need to do when they or their friends experience the same problem. Toca Pet Doctor is a fun role playing app that lets juniors ages 2+ to act as veterinarians for 15 little injured pets. The app also helps juniors to learn about preferred food for different animals, and how to take care of common pet problems. If your juniors have been requesting for their first pets, this is a perfect gateway app for them.